This documentary features two programs. 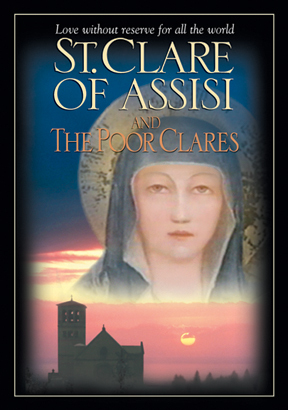 First, St. Clare of Assisi reveals the extraordinary life of St. Clare, a woman who reached the highest summits of Christian mysticism, who knew how to defend her decisions alone and who built a social reality that still challenges the centuries. Along with medieval harmonies composed by Oscar-winning musicians, the exquisite photography explores all of the sacred places in and around Assisi that characterize the life of Clare and that of Francis. The testimony of a Poor Clare in the 40-minute documentary, moreover, exemplifies the figure of Clare in today's world. The second program, included as a bonus, is Poor Clares: A Hidden Presence. More than twenty thousand women today follow the example of Clare of Assisi in monasteries scattered throughout the world - the cloistered convent, a city in prayer and a hidden presence with a love with reserve for all of humanity. The Poor Clares present in this 30-minute documentary speak of their realization as women, mothers and sisters inside the closed walls of a monastery.